Here is an example of what people once thought of when they spoke of fellow travelers. 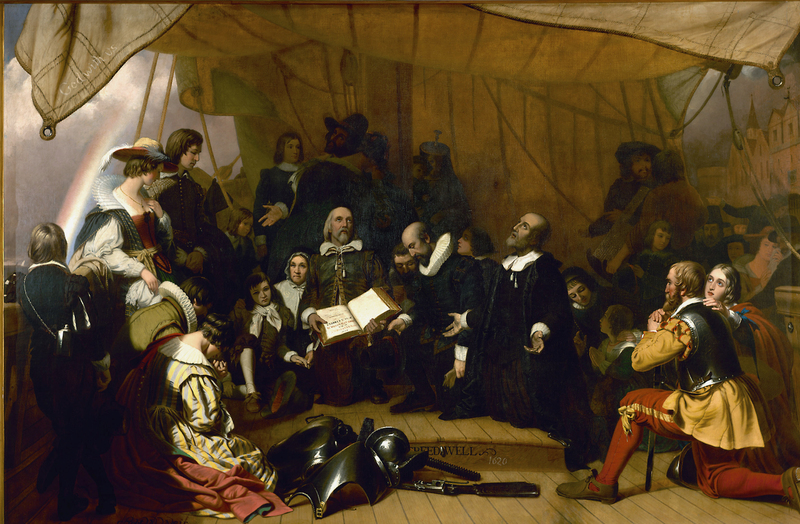 Pilgrims John Carver, William Bradford, and Miles Standish, at prayer during their voyage to America. Painting by Robert Walter Weir. Sputnik? Aside from the fact the news content was atrociously anti-American, I was suspicious of the name. What does sputnik mean? As this article indicates, Russia launches ‘Sputnik’ media offensive to counter US propaganda, sputniknews.com exists to promote Russian propaganda. It is similar in nature to rt.com. The name “sputnik news” is ironic. The word “sputnik” first gained familiarity in the West when the USSR launched a series of satellites named Sputnik. Since artificial satellites generally orbit the earth, most satellites are in fact a “traveling companion of the Earth”. oxforddictionaries.com, however, describes a slightly different origin for term “sputnik” which adds a bit of perspective. 1. a person who supports or sympathizes with a political party, especially the Communist Party, but is not an enrolled member. 2. anyone who, although not a member, supports or sympathizes with some organization, movement, or the like. Read The Night Wind’s comments defending (here and here) sputniknews.com. The Night Wind is something of a fan of Vladimir Putin. Thus, the Night Wind’s comments suggest that that old KGB agent’s propaganda is having some success. Are The Night Wind’s complaints about the Western news media legitimate? Sadly, the answer is yes, but reading Russian propaganda hardly constitutes a solution. What makes us so vulnerable to such propaganda in this country? We need to think about that, and we need to formulate a solution. So let’s consider the nature of the problem. What factors make it more difficult than it once was to discern the truth in the news? The mechanics of our government have changed drastically. When it originated, the Federal Government had little power. Except for a few items, those actually enumerated in Article 1, Section 8 of the Constitution, most government operations — what little there were — in the United States were state and local. Then we could see for ourselves what was going on and speak to our leaders face-to-face. Yet the Federal Government now spends nearly twice what our state and local governments spend. Why has local government diminished? To make local government work, we must be engaged in our local communities, but power-grabbing politicians have nearly torn our local communities apart. Unlike previous generations of Americans, we are not skilled in the art of community organizing. We would not even use such a phrase the same way. Our forbears would have thought of organizing to perform a charitable work. We think of community organizing getting the government to spend other people’s money. Our forebears spent most of their day engaged within their local communities. They worked, educated their children, went to church, and played (even the adults) with their immediate neighbors. Today not many of us do that. We spend our days tens of miles from home at our jobs, and we waste hours traveling on government-run roads that don’t work. Then we compound the damage. We educate our children in poorly managed government-run schools that discourage parental involvement. We may not go to church, and most of us spend hours a day escaping our “problems”. We “play” on a TV or Internet, or we just commiserate with each other by boozing it up with friends. What do I think we should do? Well, turning sputniknews.com or rt.com for information is not going to help us. We know these people are trying to deceive us. Instead, we need to decrease the power and importance of government. We need to diminish the vast wealth our government controls. We need to make lying to us less attractive and less profitable; we need to bring government closer to home where we can keep an eye on it. We need to stop giving politicians OTHER PEOPLE’S MONEY to pay for public infrastructure. The worst kind of politicians sell access to OTHER PEOPLE’S MONEY. When we pay for our roads, for example, with OTHER PEOPLE’S MONEY, in return for campaign donations and various “favors”, politicians put the roads where developers want them. Then, in return for more for campaign donations and “favors”, politicians strangle what they had the gall to call a parkway with stoplights. If we want decent transportation system, then we have to pay with our own money. We have to pay tolls. Then, developers will have to pay for their own roads. We need to stop giving politicians power to redistribute the wealth. Politicians use the power redistribute the wealth to buy our votes. That has nothing to do with true charity; such charity is just stealing. Yet we have based our education system, our retirement systems, and our health care system upon such notions of charity. Because true charity is based upon love, government cannot effectively provide charity. Whenever government tries to provide charity, larceny will result. Human nature is such that any government system that spends OTHER PEOPLE’S MONEY for the sake of OTHER PEOPLE must become corrupt, too costly, and eventually useless. We need to put the kibosh on the identity politics. What just happened in Florida illustrates the gravity of the problem. Because of the fact they tend to vote Democrat, some of our glorious leaders want to import all the poor, dark skin people they can into this country. That includes Muslims. Yet as events keep demonstrating, our leaders have no way whatsoever of screening out Islamic terrorists from a peaceful Muslims. So why then is the LBGTQ crowd voting for Democrats? Consider their choice, our choice. Is it more important to force our views on others or to be left in peace to pursue our own definition of happiness? Why do we have to drive so far and spend so much time traveling to work? Everybody wants to live in the country in a big house with a big yard. So politicians have subsidized what we wanted with OTHER PEOPLE’S MONEY (so-called parkways), and they have protected big yards with zoning laws. Why do we have expensive schools that don’t work? Everybody wants a fabulous education for their children. So politicians have subsidized what we wanted with OTHER PEOPLE’S MONEY. They have built costly schools and staffed those schools with expensive teachers and administrators, members of public employee’s unions who kindly contributed to and worked for their reelection. Therefore, since those schools must be run by the government and secularized, we have created socialist institutions promoting the glories of Big Government. Why don’t local communities provide charity, and why is our country going broke? Everybody wants a fail-safe financial safety net. So politicians have subsidized what we wanted with OTHER PEOPLE’S MONEY. Thus, we have food stamps, Social Security, Obamacare, and dozens of other programs that cost too much. Why do politicians keep insisting that it is a small world and diversity means everyone must be politically correct? Everybody wants the assurance that everyone else likes them just as they are. We want everyone to think like us, and we don’t want anyone better or worse off than we are. That is, because every little community would be different, we cannot get by with local government. Otherwise, we actually would have diversity. So we have to nationalize every problem and make everyone think about everything and do everything the same way. Therefore, as the result of too much government, we don’t have time to spend in our local neighborhoods, we don’t have much reason to talk to our neighbors, and we have trouble believing anything the news media wants to tell us. You don’t believe me? Then please explain why we have to choose between Donald Trump and Hillary Clinton for president. We are now living in very troubling time in our world. But there have been many worse times in the past as recorded in history that our ancestors lived and endured. Have faith in the belief that our Creator has a purpose for each and every one of us. If having to choose between the only viable choices we have running, choose an issue as I explained in a previous post rather than giving up and not voting at all. We must preserve and do our best to try to change our nation for betterment of the future. We may never know the outcome of our efforts, but we do know that if we do not try, nothing will change. That was not the answer I was expecting, but I concede there is wisdom in it. Thank you for the response. Aside from our opinions about Russia, I basically agree with everything else here. Courage and personal responsibility would solve 90% of the United States’ problems. The embarrassment being, that the Congressmen involved had hear about state sovereignty and their Constitutional duties from Iranian Ayatollahs. I would love to have printed a similar letter from the Governor of North Carolina or the CEO of Target refusing compliance with TG bathroom demands, but none were forthcoming. Outsourcing our duty as citizens to the government is like outsourcing jobs overseas. Both are never to return. It is an axiom of political science that tyrannies have to be utterly destroyed by war before they will give up even one grain of their ill gotten gain. We need to come to grips with the fact that America, the Land of Free is long gone. Once we come to grips with the fact that America, the Land of the Free is long gone, we have a very unpleasant problem. If at all possible, I would prefer a peaceful revolution conducted by a determined citizenry that understands its duties as well as its rights. Naive? Think about what watering what the tree of liberty means. Gestapo-like night arrests. Ambushes of Gestapo-like law enforcement officers. Public riots with thousands dead. A public infrastructure scavenged for metal. Starving people. There is nothing pretty about revolting against a tyrannical government. Generally, even a bad government is better than none, but if our leaders refuse to give up power, our people will have to decide what they want. So (as I suspect you do as well) I think the real question is whether we will have enough sense to insist our leaders give up their power. Unless enough of us have the good sense to make such a demand, America, the Land of the Free, is long gone. Progressivism is the 3rd American crisis. The first two, the British Crown and the Colonies and slavery, were resolved by total, catastrophic war. The Progressives are too well entrenched in every aspect of society, industry, politics, education, media and science to be dislodged by democratic means. The Progressives simply don’t care about democratic means anymore because they don’t need to. All power is in their hands. When the Progressives don’t care about democratic means, we will be seeing those Gestapo raids I mentioned. Our glorious leaders have already abused the IRS, the NSA and various other agencies, particularly the EPA. Nevertheless, they have not had as much success hiding their shenanigans as they might wish. We may not have a sound republic, but we still have some checks on political power. What we are seeing now is factional politics. It stills appears to be somewhat “gentlemanly”, but that could change in a heartbeat. When significant numbers of national figures start mysteriously vacating the political realm……, the transition to a hard tyranny will have begun. Why is the current rivalry between the factions “gentlemanly”? Most Progressives do not actually uphold a well-defined ideology. Many Conservatives do revere America’s heritage, but they don’t have enough public support to secure significant power. Hence the two core factions, Establishment Democrats and Republicans are generally happy to split the pie. It is personal money, power, prestige they want, not tyranny. Even the most stupid of them realize that if a small group obtains a lock on power those out of power risk death. What these greedy people don’t know how to do is to exercise self restraint. Therefore, with each unscrupulous political deal they make, they take us one step closer to tyranny. Well, this part certainly sounds good to me! It would be expecting too much to expect all but few to agree with every part of this post. Nevertheless, I expect more than a few will read that part and agree with it. Then everyone who does has a problem. What part of the government are they willing to surrender? I would like everyone to have one. Once we start discussing what parts of government we actually need we will begin to realize how little we need. One aspect is straightforward. To the extent that government controls business, government is worth lobbying and bribing by business to limit access by competitors. If we reduce or eliminate government control of business, and limit it to inter-jurisdictional conflicts as originally intended, then almost all lobbying and favor-buying would go away — there would be little point to it. And if Amendment T is ratified (“There shall be free trade”) than favor buying and trade wars between nations will subside as well. In short: People buy control. Eliminate that market, and the buying will stop.